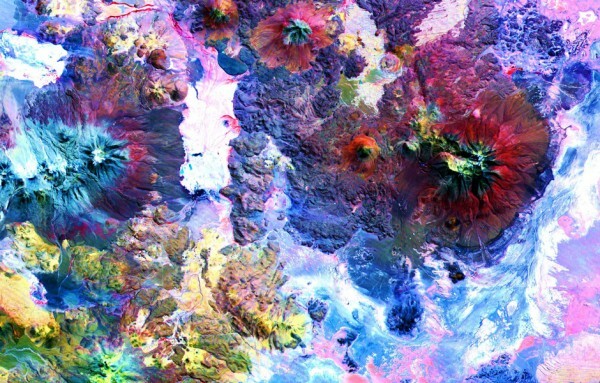 Since 1999, NASA has used ASTER (Japan's Advanced Spaceborne Thermal Emission and Reflection Radiometer) to gather images of the Earth's surface, providing a way to "map and monitor the changing surface of our planet." They've mapped 99% of the planet's surface over the years, generating nearly three million images, showing all kinds of things -- "from massive scars across the Oklahoma landscape from an EF-5 tornado and the devastating aftermath of flooding in Pakistan, to volcanic eruptions in Iceland and wildfires in California." And now, NASA is letting the public download and use those images at no cost. (Read the NASA announcement here.) You can access most of the images through a NASA database, and a smaller subset via an ASTER website. To be completely honest, you'll need some patience and technical chops to figure out how to download these images. The method wasn't obvious to me. If anyone has some clarity on that, please let us know in the comments, and we'll update the post to include your insights. Up top, see an aerial shot of The Andes Mountains in Chile/Bolivia. 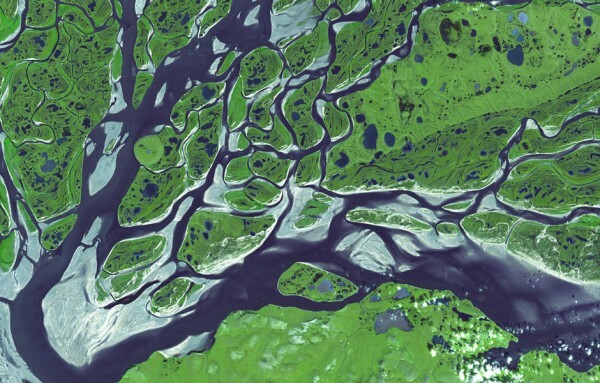 Further down a shot of the Lena River in Russia.